Sailor's vibrant Mozaique color pattern has been a favorite for many pen owners, but production of this style has now ceased and Sailor has produced just one final series of pens using this unique pattern. 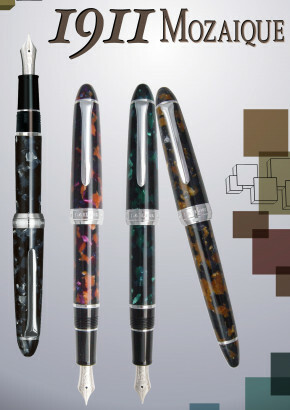 The 1911 Mid-Size Mozaique pens in Black, Brown, and Red are being made available through us by special arrangement with Sailor and their U.S. distributor. Normally provided with only a Fine or Medium nib, we are able to offer these pens with your choice from among the full range of Sailor 14k solid gold rhodium-plated nib units. Just a very small number of pens in each of the three colors have been produced, after which no more will be available - we strongly recommend ordering soon to ensure getting the pen you would like.